In a rematch of the Metro championship game, and a matchup of the two best teams in the state of Washington, the stage was set in Tacoma to watch the athleticism unfold between Rainier Beach and Garfield. 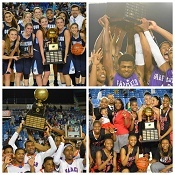 Both inter-city Seattle schools, both defending state champions (Garfield won 4A last year) with the coveted 3A crown to take home. The game began with a frantic pace, as it always does with these two teams. Beach got off to a quick lead behind eight first quarter points from star De’Jounte Murray. But the Bulldogs responded on the back of Jaylen Nowell, a sophomore star who responded with seven in the first. Neither team slowed down in the second quarter; the pace remained at the highest level of the tournament. Even with the extremely fast pace both teams took care of the ball quite well, not allowing the opposition to get easy buckets in transition. Both defenses held firm, and the halftime score was tied at 26. The Tacoma Dome was electric to start the second half. Neither team was able to pull away in the third quarter, but Garfield appeared to have more control going into the fourth. After a back and forth third, Garfield held a 44-41 lead entering the final frame. Shadeed Shabazz started the quarter hot for the Vikings, converting on two straight layups in under 30 seconds to take a one point lead. The teams exchanged baskets, and Garfield continued to attack the basket, getting into the bonus, and knocking down their free throws. With three minutes to play, the Bulldogs held a five point lead. De’Jounte Murray responded with a beautiful reverse layup, but the Bulldogs answered with a put back layup by Jaylen Nowell. After a Rainier Beach miss, Austin Anderson for the Bulldogs knocked down two more from the line to take a seven point lead, the largest of the game for either team. 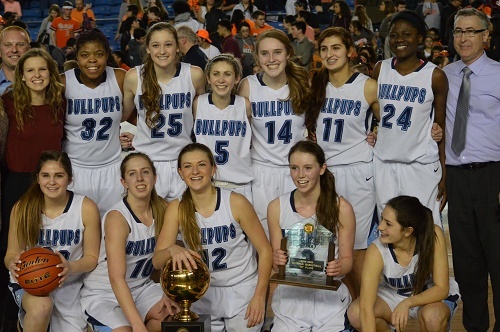 From there, the Bulldog floodgates opened, ending the game on a 17-2 run. 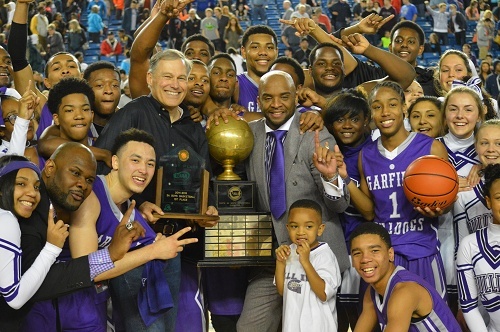 Congratulations to Garfield, the back to back state champions! 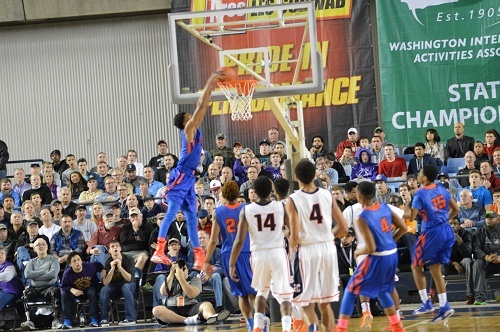 This Garfield win ended a Rainier Beach run of three consecutive 3A boys state titles. Let’s get something straight to start this game. This game was the 4A state final. 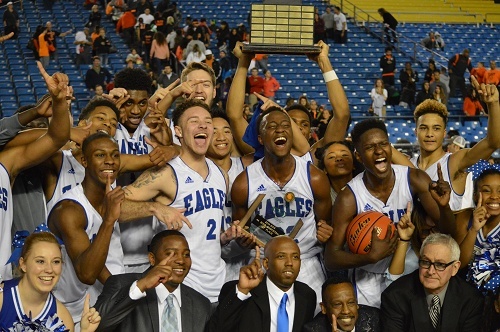 These two teams met on December 6th and Federal Way beat Davis 88-43. I will write that twice for emphasis. 88-43. At Davis High School. 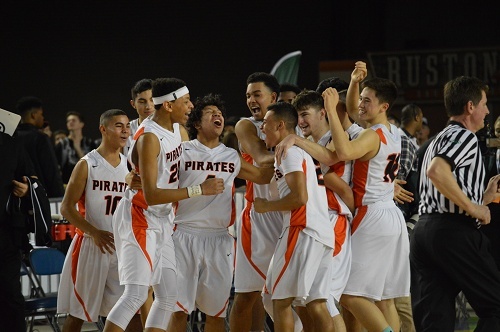 A win for Davis would be the biggest, and I mean biggest, in high school basketball history. Don’t worry, it didn’t happen. Davis was outmatched at every position on the floor. Not only outmatched but also significantly outsized. But the Pirates hung tough in the first quarter, only trailing by four after one. Federal Way was able to extend their lead on the back of poor shooting and questionable execution on offense from the Pirates. They resorted to far too many jump shots and did not run any sets in the half court. There were too many possessions of either one or no passes and then a ridiculous shot. Federal Way led 32-21 at the half. 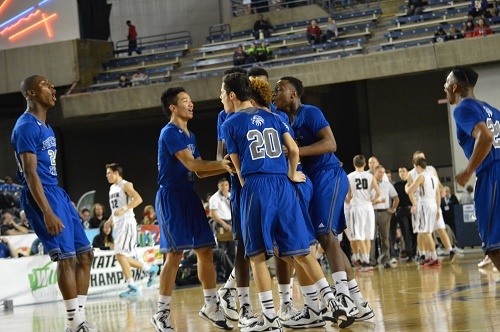 Federal Way kicked off the second half with an 11-2 run to extend their lead to 20, the largest of the game. That lead would be cut to 15 to end the quarter, 47-32. Davis would come as close as 12 in the fourth quarter. Hats off to them, this was much more of a contest than their 45 point loss to the Eagles in December. Balanced scoring from the Eagles allowed them to finish off a 65-46 victory. 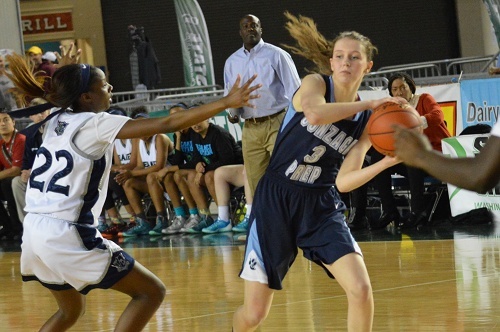 The final girls game of Friday night was a 4A semifinal with Todd Beamer and defending champions Gonzaga Prep to determine Inglemoor’s opponent in the title game. Occasionally, the Hardwood Classic features games that are wars of attrition and this particular matchup played out as such. 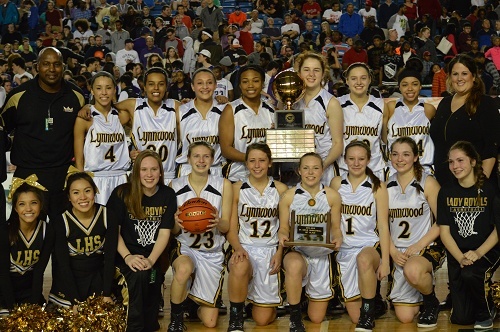 A half dozen lead changes, four ties, and a heroic three-ball in the final seconds were the ingredients to determine the representative in the 2015 final from the bottom half of the bracket. The defending champs rolled out to a slow start by only recording five first quarter points and submitting a seven point in the process. 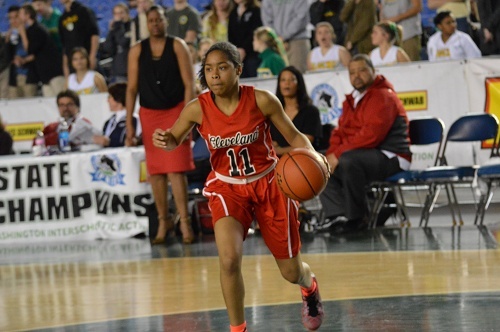 Todd Beamer grabbed the largest lead of the game early at 14-5 with Quinessa CaylaoDo heating up for what would become a monster game. With only four Bullpups recording points in the contest, the combination of Laura Stockton, Otionta Gildon, Tayler Drynan, and Oona Harrington would need to improve the 22% first half shooting percentage in addition to back-to-back single digit quarters. At intermission, Beamer led 20-14. As Coach Mike Arte has shown many times in his coaching tenure with GPrep, halftime adjustments and the ability to instill composure in close ball games was demonstrated once again. The Pups strung together the highest point total of the game in the third to bring the score to a 33-33 tie heading into the final frame. The crowd at the Tacoma Dome started gravitating its attention to what was shaping up on the north court. A tense fourth quarter with minimal scoring came down to a one point lead for Todd Beamer after a tough turnaround in the paint by Nia Alexander with under thirty seconds remaining. CaylaoDo recorded 20 of TBHS’ 39 thus far and the Titans were one possession away from a state berth. Stockton has the ball at the top of the paint…works the ball to the wing…the ball is passed to an open Lauren Weir in the corner but is tipped…Stockton recovers…ball back to the wing and Stockton twice more…clock is dwindling. Stockton hoists one up from the top of the key with a defender closing fast. Nothing but net. The Gonzaga sideline erupts. Beamer quickly inbounds the ball to set up a desperation shot but it is intercepted and a Bullpup is running the ball and clock to zero in excitement. 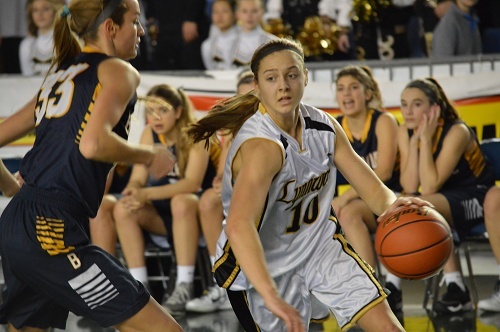 The basketball is in the hands of Laura Stockton. Ballgame. Gonzaga Prep to its back to back state final. All season long, Steve Dion and Colin Caruso have been in gyms throughout the state watching the best high school basketball Washington has to offer. With the 2015 Hardwood Classic at the Tacoma Dome coming up, they break down the 3A and 4A brackets for boys and girls and use what they saw throughout the season to project what they expect to see at the Woodshed this weekend! To catch the complete State Tournament Preview with Steve Dion and Colin Caruso, simply click on the PLAY BUTTON below. Steven Dion and Colin Caruso have covered the best hoop teams all year round. Now they breakdown the 2015 3A and 4A State Tournaments scheduled to take place at the Tacoma Dome starting on Thursday. 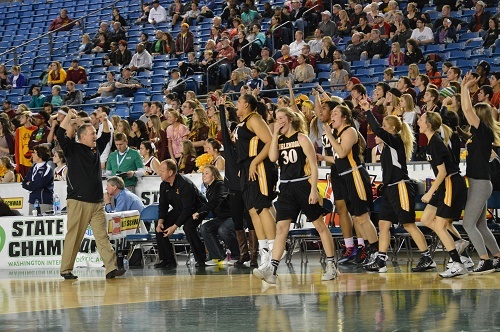 Regionals have arrived and what was once the state tournament round of 16 is now a final week of elimination games to determine the eight that will represent their classification in either the Sundome, Spokane Arena, or Tacoma Dome. 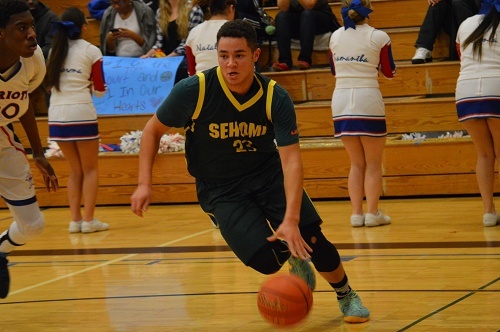 In a clash of 2A dark horse competitors from the west side of the state, Sehome would square off against Washington hailing from Tacoma. The site Renton High School provided a geographical advantage to the Patriots, but the Mariners’ faithful were out in full force to cheer on the green and yellow. A game loaded with momentum swings featured one player that willed his team to victory. A stark size advantage by Sehome presented itself early as 6’7 forward Leighton Kingma lit up the scoreboard in a matter of minutes. A pair of corner threes and multiple high percentage shots down low provided the sophomore with 17 first half points. Patriot senior Chandler Whalen countered with 9 in the first sixteen minutes to keep the margin close. Marcus Montag showed resilience as the Sehome guard received an incidental elbow to the face and minutes later hit the deck hard forcing him to the bench for a short spell. The Mariners took a slim lead to break with a halftime score of 36-32. Insightful coaching by Karl Cordes changed the complexion of the contest early in the second half when he brought Willie Thomas into the game. The freshman forward made an instant impact as he added a presence in the post and an additional scoring option for the Pats. Sehome guard Tanner Clark also started making his presence felt on both ends as he registered a double-double including a game-high 12 rebounds. A fantastic finish was shaping up as the fourth quarter began tied at 49 apiece. Thomas continued to carry the offense and knocked down clutch shots and pulled down key rebounds. Tory Causey and Whalen continued to feed the hot hand as the freshman finished with a dozen points and eight boards. With a five point lead and three minutes remained, Washington appeared to in the driver’s seat to a win. Additionally, Kingma and Logan Deboo were in foul trouble sitting on the bench. Marcus Montag stepped up and knocked a contested three to cut the lead to two. A stop and quick basket tied the ball game up with a minute and a half to go. Sehome continued to protect their bucket and Montag was fouled twice in the final ninety seconds. He nailed all four pressure free throws in the bonus to complete a 12-0 run in the final minutes. The Mariners pulled off a major comeback to punch their ticket to the Sundome for the big dance.